We took the smaller, AC bus from the bus station at Kandy (360Rps ea) and began the slow procession out of Kandy and its surrounding districts. We found ourselves still going down to the north, central plains from Kandy, although at a much slower descent. 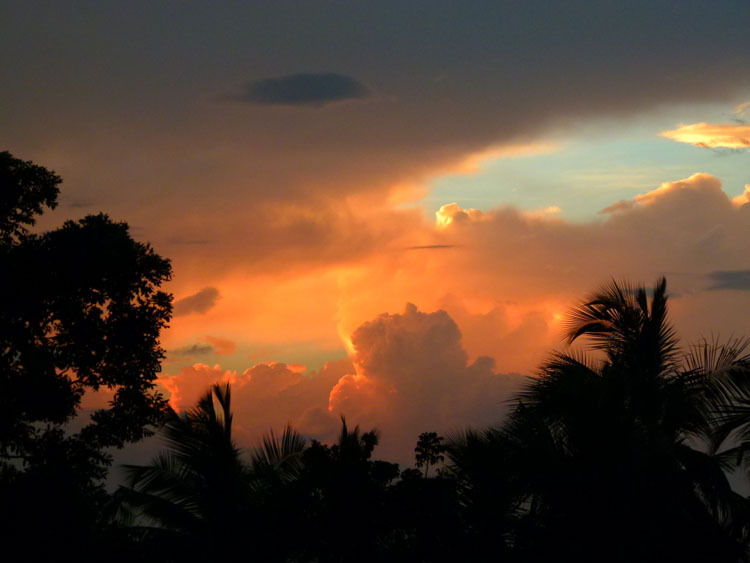 The countryside was lush with rice paddies and thick stands of palm trees. The road is popular for its Spice Gardens and up to 30 of them can be found on this stretch. After 72kms, the bus dropped us in the main street after wandering off down a country road for some time on the other side of Dambulla – heaven knows why! We’d gone well past our guesthouse but it wasn’t a problem to get a tuk-tuk back there. The grandly named Girilena Resort (4 rooms and a garden) lies at the base of Dambulla Rock, an enormous, granite outcrop that towers 160m over the surrounding plains and is the setting for the famous Dambulla Cave Temples. It can be seen for miles around. The guesthouse is engulfed by tall trees and palms and a well-tended garden leads to a mud brick bungalow with a palm thatched roof that serves as a communal eating area. We chilled out for the afternoon in our lovely room and watched some TV with the AC on – nice! At 5.30pm I climbed up on the rock with my camera for sunset. I wasn’t disappointed was the sun set directly below a distant, conical-shaped mountain, casting a golden aura around it as it sank toward the horizon somewhere behind it. We enjoyed dinner cooked by the owner’s ( Janaka) wife and met Poala and Bruno, Italians who were really funny. Poala has to translate a lot, but Bruno has a way of making himself understood. Our limited knowledge of Italian came in pretty handy at times. Also joining us for dinner were an English couple and a couple from Moldova (of all places!). They were quite surprised to learn we had visited their country! The next day we left the Cave Temple visit till almost lunchtime. It’s only a 10min walk around to the entrance ( 1500rps ea). Once again it was quite hot and we were immediately greeted by the customary stairs required at all Buddhist temples! At the top you are required to remove your shoes and any hats and pick them up on leaving (100rps ea). The UNESCO World Heritage site contains 5 main cave temples containing 153 Buddha statues, 2 huge reclining Buddhas and even a couple of Hindu statues of Vishnu and Ganesha. The temple complex dates back to the first century, is still functional and remains the best-preserved ancient edifice in Sri Lanka. Entry used to be via the Golden Temple at the town side of the rock, but 2 monk factions are fighting over legal control of the temple so it’s been moved to the rear. With 1500rps entrance fees it’s hardly surprising! We walked into town later on to find an ATM and buy an umbrella and some mozzie repellent. Dengue Fever is a thing here and it pays to be safe. We enjoyed dinner with the others again and heard all about today’s exploits over a few beers and a laugh. After breakfast the next morning, we took tuk-tuks with Poala and Bruno to visit Sigiriya – BUT not THE Sigiriya, the famous Lion Rock that juts up vertically 200m above the surrounding rice fields! We had chosen (after taking some advice) to climb the adjacent rock called Pidurangala. We did this for a few reasons. Firstly, of all the tourist brochures featuring pictures of the rock (that’s every single one!) not one of them was actually taken from on top of the rock. The best angle for taking in the whole rock is either from a drone or somewhere nearby at around the same height. Enter Pidurangala, less than a kilometre away and almost the same height. Secondly, at 4800rps each, more budget-minded tourists are baulking at the cost as(like many other sites here in Sri Lanka), it is becoming harder and harder to justify. 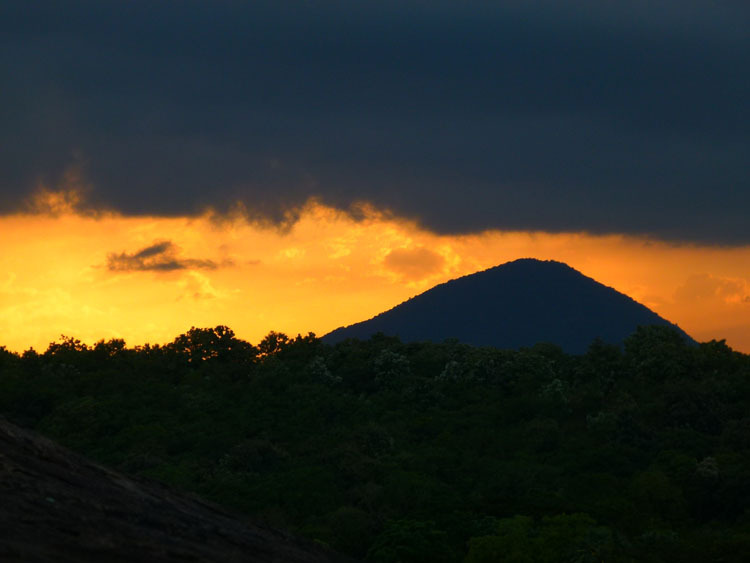 The outstanding view of Sigiriya from Pidurangala will set you back 500rps. 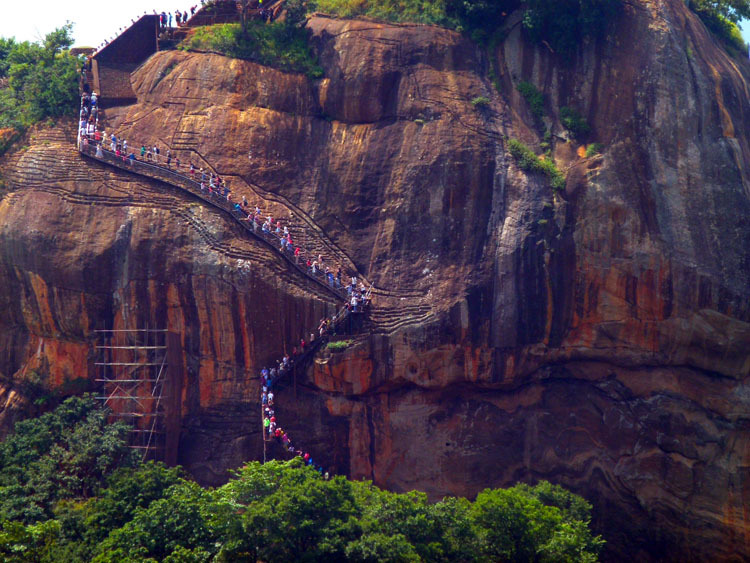 Thirdly, as mentioned to us by several people previously and witnessed from the top of Pidurangala, the rock is jam-packed with tourists, slowly grinding their way up and down an almost vertical staircase in a super, slow motion conga line that is testament to people’s willingness to be herded like sheep at their own expense so a few people can make a lot of money! View of Sigiriya from Pidurangala. Just like the tourist brochures! Don’t get me wrong. 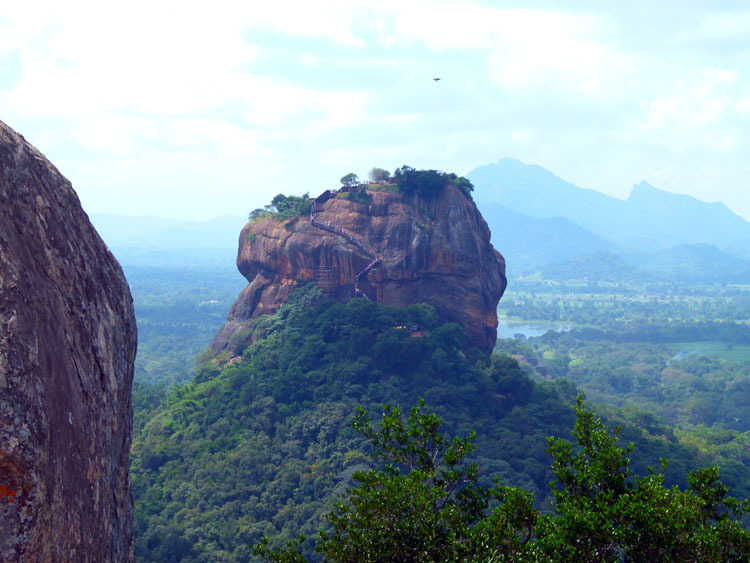 Sigiriya certainly has things to see, and hiring a guide would be the best way to appreciate it. I think after taking your budget and the limit of your patience into consideration, you’d be able to make an informed decision about whether or not you’d pay it a visit. And, if you’re physically capable, there’s nothing to stop you doing both! Pidurangala is no easy climb either. After about 30 mins of ascending roughly hewn rock steps you come to a large, reclining Buddha. If you follow the cliff face closely up a small incline after the Buddha you come to a small pond with lily pads floating on top of the green water. Look carefully and you’ll see some water snakes swimming around. We even saw a green tree snake hanging from one of the branches overhanging the water. After the Buddha, the track become a mad scramble over large boulders to the top. It’s wise to go up in pairs and help each other up from here. The climb is hot and humid and we were saturated once on top. The breeze blowing across the broad summit was a welcome relief. The view of Sigiriya and the surrounding plains of rice paddies was nothing short of spectacular, and certainly worth the climb (as many of the others up their testified to). We spent 30 mins up there admiring the view and getting some good shots of Sigiriya. On closer inspection with my camera zoom, we could see one of the reasons we didn’t want to climb the main attraction. A staircase zig-zagged its way up the sheer cliff face on the northern side and was choked full of tourists going up and down. There was hardly any movement at all – at least they could stop and admire the great view over to our rock!! Going down was somewhat easier with gravity to help us. We’d just slide down on our bums to the next rock below. At the bottom Poala and Bruno were waiting for us with Janaka and the other driver. We had a cold drink and rested before heading back. Once again we enjoyed a few beers and more than a few laughs at dinner. 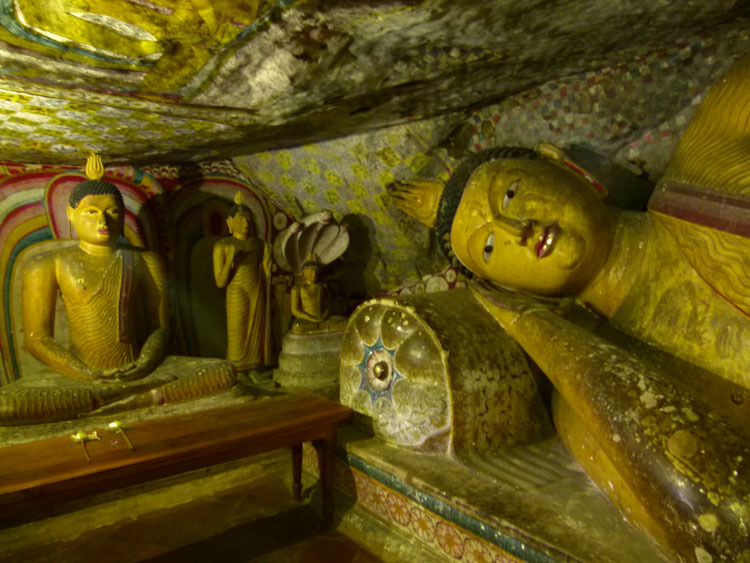 Dambulla is a good base to do both the Cave Temples and Sigiriya. 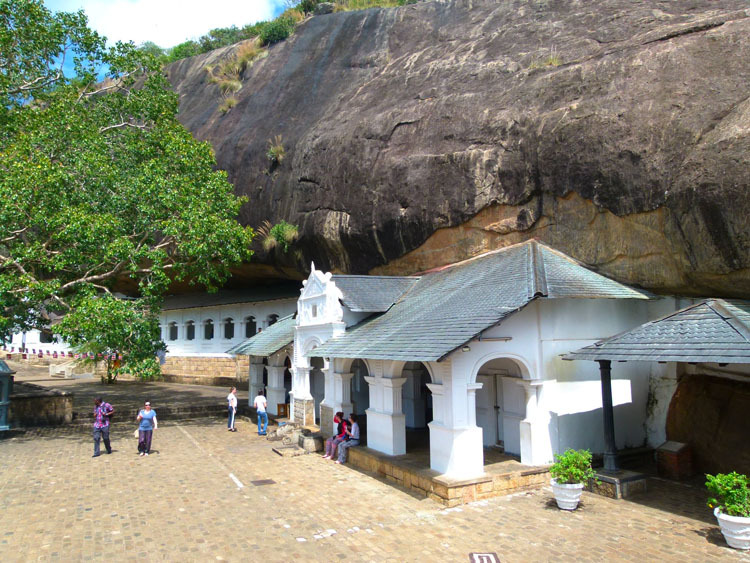 If you have the time, money, fitness and inclination, you could climb Sigiriya first and then Pidurangala next to get a good view of the rock itself. 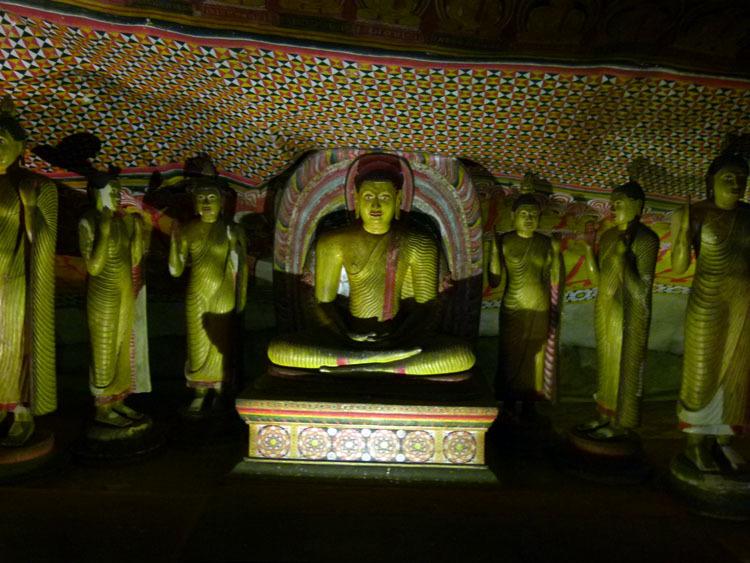 Take something to cover your shoulders and knees to enter Buddhist temples.